Rebecca Amery will represent CDU at 3MT finals. PhD candidate Rebecca Amery will represent Charles Darwin University at the 2018 Asia-Pacific 3MT (Three Minute Thesis) Competition next month. Rebecca attracted both the audience and judges vote in the Northern Territory finals with her thesis, “Understanding communication difficulties of Yolngu with Machado-Joseph Disease (MJD)”. In her presentation, Rebecca compared renowned theoretical physicist Stephen Hawking to Peter, an Indigenous man from Arnhem Land. Rebecca said the two men suffered different diseases, but both subsequently had their speech affected. “Mr Hawkins was wealthy, well-educated and spoke English. As a result of his disease, he suffered dysarthria and used a high-tech communication device to speak,” she said. Rebecca, who has a degree in speech pathology, said alternative communication systems were predominantly English. MJD is a genetic neurodegenerative disease that affects the control and coordination of muscles used for walking, fine motor skills, vision, continence and speech. While it occurs worldwide, in Australia MJD predominantly affects Aboriginal people in remote communities. 3MT is a competition held in more than 600 universities that challenges PhD students to present their research with no props and in an engaging way to a non-specialist audience. 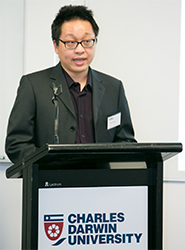 The 2018 Asia-Pacific 3MT Competition is on 27 September in Brisbane.